Women constitute about 32% of Philosophy Bachelor's degree recipients in the U.S., about 29% of Philosophy PhD recipients, and about 20-25% of philosophy faculty. (Paxton et al 2012; Schwitzgebel and Jennings 2017). It is sometimes suggested that the relatively low percentage of women faculty in philosophy explains the relatively low percentage of women who major in philosophy (which then in turn explains the relatively low percentage of women who become the next generation of philosophy faculty). I was curious whether philosophy departments with a relatively high percentage of women faculty would also have a relatively high percentage of students who are women. 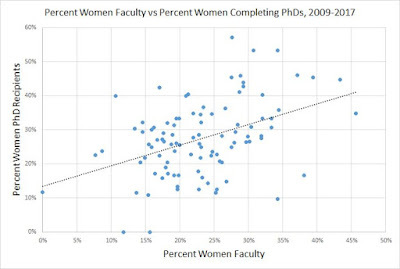 Maybe departments with more women faculty are more "woman friendly", with a visible effect on the proportion of women who complete the Bachelor's or PhD? Paxton et al. 2012 provide some evidence of a relationship between departments' proportion of women faculty, women undergraduates, and women graduate students. In a sample of 49 departments, they found a substantial correlation between the percent of women faculty and the percent of undergraduate philosophy majors who are women (r = .45, p = .012). However, in a similar sample of 31 departments, they did not report finding such a correlation between percent of faculty who are women and percent of PhD students who are women. There are a few limitations in the Paxton et al. study. First, thirty-one departments is a somewhat small number for such an analysis, yielding only limited statistical power to detect medium-sized correlations (note that with 49 departments in their undergraduate analysis, Paxton et al's p-value was greater than .01 despite a correlation of .45). Second, the sample of departments might be unrepresentative. And third, the proportion of women who complete the PhD might be a better measure of women-friendliness or women's success than proportion enrolled in the PhD program, since a substantial proportion of philosophy PhD students do not complete their degrees (in many departments completion rates are around 50%) and (anecdotally) non-completion rates might be higher for women than men (I welcome pointers to systematic data on this). For these reasons, I decided to examine whether in a larger sample of PhD-granting philosophy departments in the U.S., the percent of women faculty would correlate with the percent of women completing the PhD. 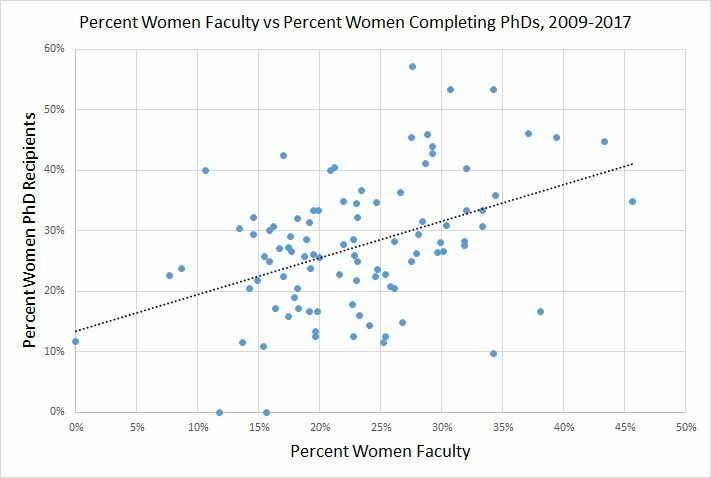 Overall, women were 20% of faculty in 2006 (340/1669) and 25% of faculty in 2015 (442/1755), a statistically significant increase (z = 3.4, p = .001). Although 20% to 25% may not sound like much, it is actually quite remarkable for such a short period. The faculty growth between 2006 and 2015 in this set of universities was only 86 positions (from 1669 to 1755 total faculty), while the growth of women faculty was 102 positions. The pattern in undergraduate Bachelor's degree completions in these same institutions is in some ways similar. Among these 97 institutions, the percentage of women earning BAs increased from 29% (1066/3618) to 34% (957/2787). This is statistically significant (z = 4.1, p < .001), and intermediate years show a slow steady increase (30%, then 31%, then 32%). However, it is possible that this is just a brief fluctuation in a long-term trend, in which percentage of women among philosophy majors has held approximately steady at 30-34% since at least 1986. Also notable: While faculty numbers increased, graduating majors decreased (fitting with national trends across all university types). The pattern in PhD completions is approximately flat over the period (fitting with results from the NSF reported here), fluctuating between 25% and 33% women -- coincidentally, 27% both at the beginning (100/372) and at the end (113/415) of the period. However, with numbers this low, statistical power is an issue. The correlation is substantial r = .42 (p < .001). For example, although only 37 of the 97 universities had over 25% women faculty, all ten of the universities that had the highest proportion of women among their Philosophy PhD recipients did. Oddly, however, for Bachelor's degrees, I can find no relationship at all, with a correlation of r = -.01 (p = .96). This result contrasts sharply with the Paxton et al. results, and I'm not sure what to make of it. A follow-up study might look at a broader sample of undergraduate institutions to see what sort of relationship there is between percent of women faculty and percent of women undergraduates in philosophy and whether it might vary with institution type. I don't know if your data set would allow the following analyses, but if it would, I think it would be good to do them. As I understand it, you looked at what percentage of PhDs were women. A different but valuable statistic is what percentage of women who are admitted graduate? Perhaps that is what you did? If so, it would be good to know what percentage of men who are admitted graduate? If you looked at the proportion of graduates who were women, you would also want to know the proportion of women who were part of each entering class. Another valuable datum would be time to degree for men and women as a function of the proportion of the faculty who are women. I'm no pro, but I think you should emphasize the r-squared, rather than r. Otherwise, people might easily draw the wrong conclusion. Anon: That would be interesting to look at, but unfortunately I don't see a feasible way to gather the relevant data. Eric: My sense is that r, as the standard measure of correlation, is better understood and more intuitive than r^2. However, if I were claiming what percentage of the variability in percentages of completions was predicted by faculty gender ratio, then r^2 would be better. And on other days goes on about "diversity blather"
Would you agree that it does not follow from your research that if there were more women faculty then there would be more women completing PhDs? 1) It might be that women who are resolved to do a Philosophy PhD would, given a choice, prefer to be supervised by a woman and/or in a department with a relatively high ratio of women to men faculty. Which contributes towards your findings. However, they would do the PhD anyway, even if they could not find a suitable women supervisor so had to be supervised by a man. It would be strange if a woman thought, 'I will only do a Philosophy PhD if I can be supervised by a woman, or be in a faculty with a certain ratio of women to men faculty'. 2) We know that a disproportionately high number of women students and staff work in certain areas, for instance, ethics. As a result even women students with no preference as to the gender of their supervisors are more likely to be supervised by women faculty; therefore there will be a higher proportion of women students where there are a higher proportion of women faculty. Thanks for the continuing comments, folks -- and sorry for the slow reply! Dan, I agree that we can't draw the causal conclusion that more women faculty would lead to more women PhDs, partly for the reasons you suggest. Seth: I was pleased by the friendly link from Leiter, despite his negative reaction to some of my and others' other work on diversity in philosophy. Anon: Possible, though it seems unlikely -- hard to see what the mechanism would be! You use data from several years together. However, after completing PhD people often become staff members at some university. And there is probably a certain level of academic inbreeding amongst philosophy departments (let's say the rate of inbreeding is the same for men and women). Thus a higher proportion of women completing their PhDs at a university could lead to a higher proportion of women staff at the same university.